SF State has received national recognition for its commitment to international education. Staff from the Office of International Programs accepted the Senator Paul Simon Award for Comprehensive Internationalization at a ceremony in Washington D.C. last week, on behalf of University President Les Wong. 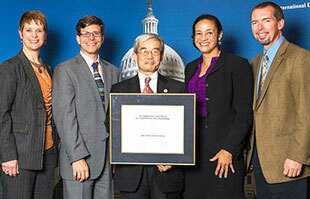 Staff from SF State's Office of International Programs accept the Senator Paul Simon Award at a ceremony in Washington D.C. From left: NAFSA President and Chair of the Board of Directors Meredith McQuaid; Coordinator of Study Abroad David Wick; Associate Vice President of International Education Yenbo Wu; Assistant Director of International Programs Marilyn Jackson; and Martin Simon, son of the late Senator Paul Simon. Credit: Len Spoden Photography. The University was one of five institutions to receive this honor from NAFSA: Association of International Educators. The award is named for the late U.S. Senator and international education advocate Paul Simon, and recognizes colleges' efforts to provide students, faculty and staff with international experiences and perspectives. Martin Simon, son of the late senator, joined guests at the Nov. 13 ceremony to speak of his father's enthusiasm for international travel, exchange and education. The presentation of the award came during the same week that the latest Open Doors Report named SF State as a top destination for hosting international students and a leader in providing study abroad opportunities. This annual report from the Institute of International Education ranked the University third in the nation among master's degree-granting institutions as a destination for foreign students. For the seventh consecutive year, SF State was ranked second among master's institutions for the number of students participating in long-term study abroad programs that involve a semester or a year overseas. "We are proud to be a leader in international education," said Yenbo Wu, associate vice president of international education. "One of our signature programs is long-term study abroad. Studying overseas is an incomparable opportunity to develop a global outlook, and the impact is so much greater when students spend a whole year living in another culture." For more information about international education and exchange programs, visit the Office of International Programs website.